Politicians shouldn't wait. Because if they do, adults and children will keep being attacked in their homes and elsewhere. And the pit bull lobby, so desperate to keep the public on side, will fiddle as they bleed. A pit bull is sitting on the pier. Death is not enough to convince people to ban pit bulls. That much is clear from the latest horrifying incident that saw Quebec woman Christiane Vadnais mauled (not bitten) to death in a backyard in Montreal's Pointe-aux-Trembles area last Wednesday. The dog had previously attacked a man at a convenience store, and even its owner's cousin. The owner had gone out of his way to keep the dog from becoming more aggressive. But even being a good owner could not stop the pit bull from taking the life of a beloved sister and a popular employee of Montreal's transit system. Politicians are understandably looking at options to restrict the dogs. Quebec's Public Security Minister Martin Coiteux hasn't ruled out a ban. But so far, even Vadnais' fatal attack hasn't been enough to convince Montreal Mayor Denis Coderre to enact legislation. Common sense must apply, he said. 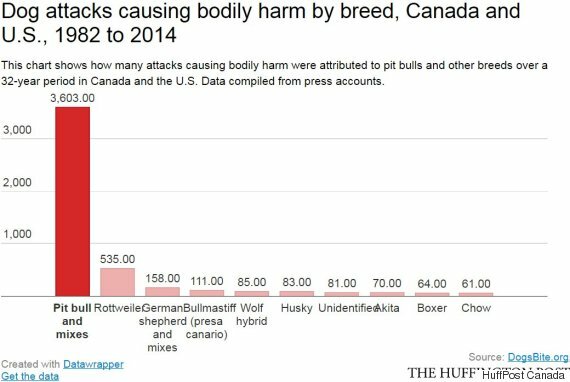 They inherently pose a higher risk of ruining a life when they attack than any other breed, by orders of magnitude. People are a tough sell on the idea of a pit bull ban because of a powerful lobby that is intent on misleading the public and verbally mauling anyone who would dare raise the prospect of one. It's a loose coalition of official organizations and pit bull lovers intent on harassing people out of their opinions on social media. I got a taste of this the last time I wrote about pit bulls two years ago. I argued it was time for every province to enact bans in the wake of a savage attack that almost left a baby without its nose. The reaction to my blog was swift, fierce and continues to this day. I received upwards of 100 tweets aimed at shaming and intimidating me. A Facebook user messaged me saying I should be put to sleep. Another heckler mocked my eye condition (I have strabismus). The last comment came to me only seven months ago. It's a lobby that misleads people with cute photos of friendly pit bulls and tall tales of the dogs serving as nannies to children. 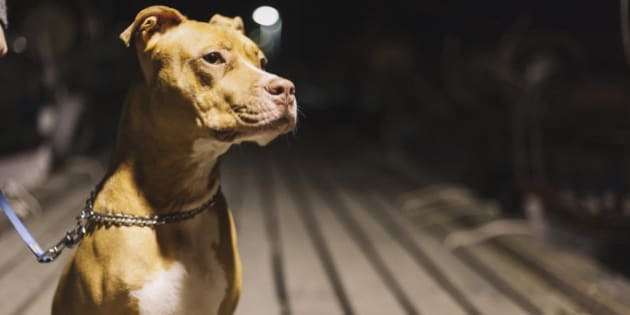 Of course, such images stand in stark contrast to pictures of savage wounds from pit bull bites -- and to statistics that clearly show the danger these dogs can pose. All of this is, of course, beside the point. It's not that all pit bulls are bad dogs. 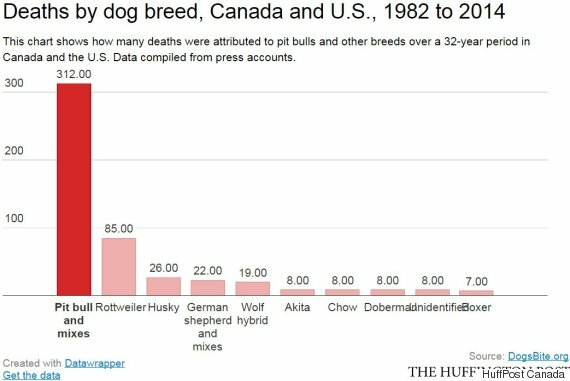 It's that they inherently pose a higher risk of ruining a life when they attack than any other breed, by orders of magnitude. Pit bulls don't just bite. They maul. Even the B.C. SPCA, which disagrees with a pit bull ban, agrees they have stronger jaws and can "do more harm." But don't expect any of this to convince the public, which largely opposes a ban despite statistics and incidents happening again... and again... and again. I understand, to a point. Pictures have power. And it's easier to look at a photo of a cuddly pit bull in a bonnet than it is to look at one of a five-year-old with a mauling scar across her face. But that just means politicians have to be stronger, take a risk and ban the dogs. Ontario's Liberals did it in 2005. 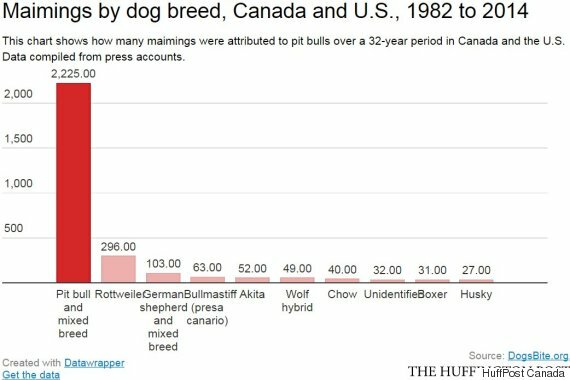 Pit bull bites have since all but disappeared in Toronto, and yet the party remains in power. I worry it would take an incident so horrifying, so destructive, so devastating to read about to finally convince the public these animals should be banned. They could even just restrict the animals, like has been done in the cities of Burnaby and Richmond. The mayors of both cities have held office for 13 and 14 years, respectively. These people have risked their political careers to keep the public safe from harm -- and they remain in office. It's just another reason why all politicians should follow, because even savage maulings haven't moved public opinion. A horde of pit bulls attacking babies in a maternity ward, for instance, or a group of children in a daycare. Politicians shouldn't wait. Because if they do, adults and children will keep being attacked in their homes and elsewhere. And the pit bull lobby, so desperate to keep the public on side, will fiddle as they bleed.